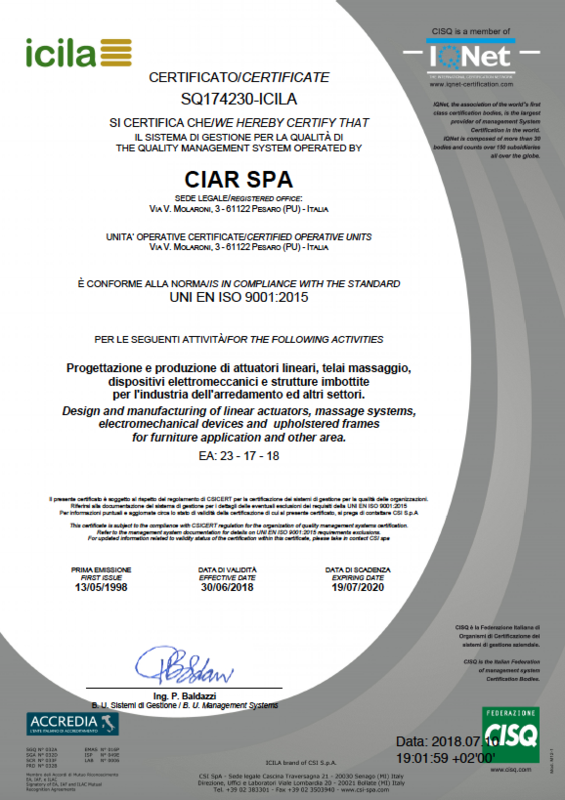 CIAR S.p.A. is a dynamic company, strongly oriented towards achieving the Quality Objectives in compliance with the ISO 9000 series of standards, for which the company is certified according to UNI EN ISO 9001: 2015. At the end of the 90’s, the company felt the need to implement a Quality Managing System and felt as innovative those policies valid at an international level. CIAR understood the importance of this strategic decision, that would help improving the overall business performance and providing a solid basis for initiatives. iv. 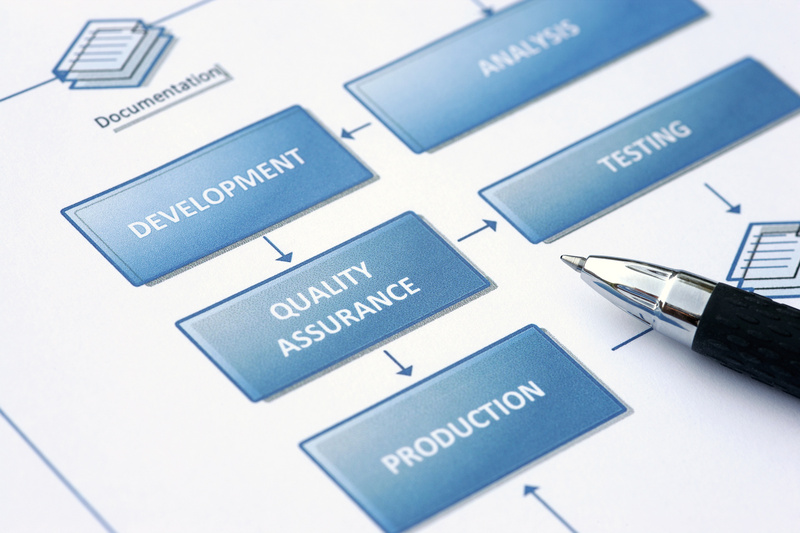 the ability to demonstrate compliance with the specified quality management system requirements. The ISO structure, as known, uses the process approach, which includes, from the first draft, the Plan-Do-Check-Act (PDCA) cycle or the Deming cycle. The process approach allows the organisation to plan its processes and interactions, whereas the PDCA cycle ensures the adequate resources, the appropriate management of the processes and the opportunities for improvement, offering a new field for the actions that this entails. However, the innovative element of the 2015 release of 9001 is the concept of risk-based thinking, which allows the organization to determine the factors that might divert its processes and its quality management system from the planned results and to implement prearranged controls minimizing the negative effects and maximizing opportunities when they arise. The company implements the typical Risk Management system of ISO 31000:2018, through a diversified SWOT analysis based on the company functions, to detect the risks of each department and to monitor them. The CIAR S.p.A. quality chain starts from the Quality Plan of the Processes, with which the logical flow of information and the logistic flow of the products are mapped and formalised. This chain then develops from this plan based on the control of process variables, periodically audited both in systemic and product form, to the management of claims, another tool that ensures the path of continuous improvement. 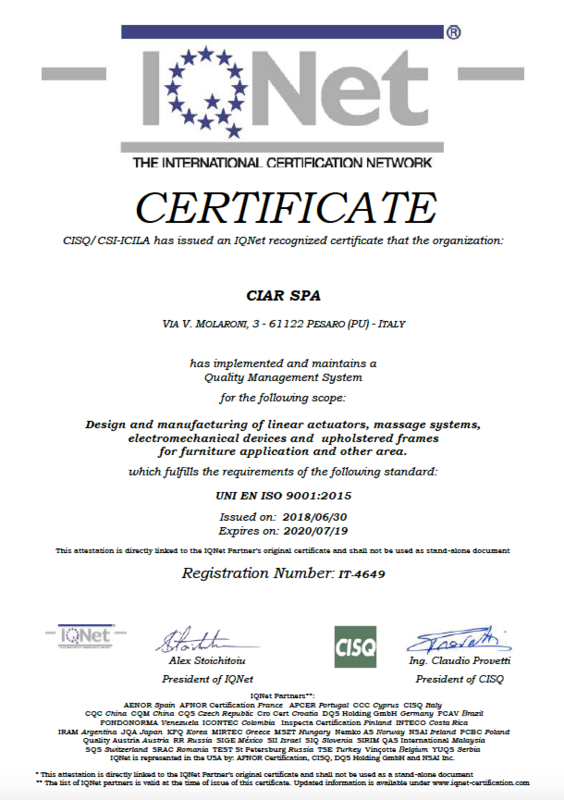 The company has been certified, since 1998, by ICILA, the brand with which CSI S.p.A., certification and behavioural analysis body, belonging to the IMQ group, provides certification services in the wood, furniture and paper industry sectors.